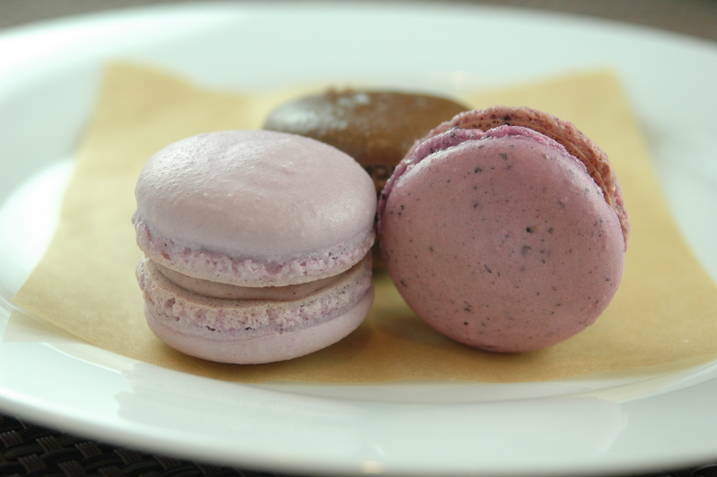 I wanted to try (to conquer) some new flavors of macaron today, plus I promised Todd that I'd make him something with chocolate and espresso. So...today I made three flavors of macaron: a repeat of the plum flavor I made a couple weeks ago (they were just so good! ), a chocolate macaron with chocolate espresso ganache (I threw a touch of Kahlua in there for good measure), and a Marion Blackberry flavor. I had hoped to make a macaron using some kind of unusual frozen fruit from the grocery store (I was thinking passion fruit or guava), but they didn't really have any "unusual" fruits. Back when we were in NYC, I could buy fruit purees, just about any kind, at lots of locations throughout the city. But, the Marion Blackberries were really pretty and came in a nice biodegradable bag, which pretty much sold me on them. Ha ha! I also bought some freeze-dried blueberries (couldn't find blackberries), which I ground into a powder and added to the macaron batter for the blackberry flavor. It gave the cookies a nice speckle and added to their flavor. I'm somewhat lacking in photos today, it was cloudy and overcast and we don't have much natural light back here as it is. I snapped just a few pics, will try to get some more tomorrow to show off the details! 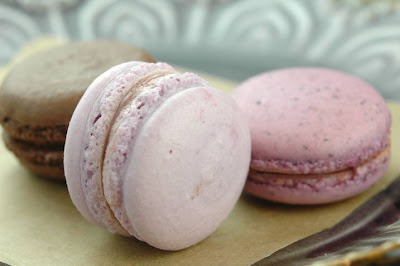 I will share a few recipes today, for my macarons, as well as some insight on the outcomes and tips/suggestions/ideas. Process blueberries in food processor, along with powdered sugar and almond meal. Sift and set aside in a large bowl. Divide the egg whites in half and set one half aside. Beat the other half to firm peaks with a stand mixer. While whites are whipping, heat sugar and water in a saucepan to 244°F. When sugar water is at temp and whites are at firm peaks, turn off mixer and pour hot sugar into whites then immediately begin whipping again at high speed. This creates what is called an Italian Meringue. When the meringue has cooled to just slightly warm, add the extra egg whites to the dry mixture, followed by the meringue and use a folding motion to incorporate all of the ingredients. The batter, when mixed appropriately, should be the consistency of molten lava...Not that that's a concept that most of us will be very familiar with in real life, but you'll probably figure it out! Pipe the macaron onto a parchment-lined sheet pan, double-stacked. Today, I baked 330°F, just to see what the extra 5° would do for me. I still baked all cookies on double baking sheets, but I did notice an impact using some new (thinner/cheaper) baking sheets. Since the double sheet is supposed to protect the bottoms of the macaron from browning or heating too much, I did realize that the bottoms of today's cookies were crunchier than past batches. (A little too much so.) Not sure if this is from the thinner pans or the extra 5°. Will bake on these pans again at 325°F and see what happens. I also baked this batch of macaron without letting them sit at room temperature. Overall, the MOST IMPORTANT thing I learned today is something I warned all of you about just the other day. If the macaron have peaks on top that don't settle out, it's very important not to overwet them. I think I used too much water on my fingertip to smooth the peaks and ended up compromising the integrity of the cookie shell for many of the first batch. This batter was slightly too thick, so I'd probably cut back a little on the quantity of dry ingredients next time. Cookies were DONE (no question) by 14 minutes in the oven and removed easily from pans. I ended up with half of this batch being "macawrongs" because of my overzealous wet finger. Heat blackberries over medium heat to a boil. Mix pectin with agave syrup. Once blackberry mixture is at a boil, remove from heat, stir in pectin/syrup mixture and stir well to dissolve. Place back on the heat and cook, stirring well, for a couple minutes. Remove from heat. Since I don't have equipment to can at home, I just poured this into an old glass jar (while hot), screwed the lid on and let it cool. Once cool, I refrigerated and will use within a few weeks. If you want to can this to store for a longer period of time, you should probably check out another resource on canning like this. Or this. Once this sits overnight in the fridge, the pectin has a chance to work and the jam thickened completely. I filled some of the macaron with the jam itself and, the other half I filled with a buttercream mixed with a 1/4 cup or so of the jam. Both combinations were good, and a touch sweeter than I'd have preferred. Process cocoa, powdered sugar and almond meal in a food processor. Sift and set aside in a large bowl. Divide the egg whites in half and set one half aside. Beat the other half (along with the meringue powder) to firm peaks with a stand mixer. While whites are whipping, heat sugar and water in a saucepan to 244°F. When sugar water is at temp and whites are at firm peaks, turn off mixer and pour hot sugar into whites then immediately begin whipping again at high speed. When the meringue has cooled to just slightly warm, add the extra egg whites to the dry mixture, followed by the meringue and use a folding motion to incorporate all of the ingredients. Place chopped chocolate in a bowl. Heat cream just to scalding and dissolve espresso powder in the hot cream. Pour over chocolate, wait 2 minutes then whisk smooth. Add in the Kahlua if using. Allow to settle and harden at room temperature or in the fridge for a bit. Whip with a hand mixer before using to lighten and soften. 1. My ideal temperature (in this oven) seems to be 325°F, 330°F was too hot. 2. I will not be using pasteurized egg whites again. 3. Aging whites seems to be a good idea. 4. Letting the macaron sit on the counter to form a skin before baking also seems like a good idea. 6. Have fun, keep testing, keep learning!